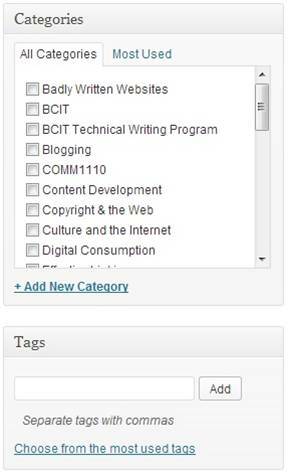 What are Tags and Categories in Blogging? Let’s face it, the odds of becoming a famous blogger are not really in our favour, but ultimately with any social media and online interactions, it’s about the quality of your communication, not the quantity. However, if you are trying to get your blog read and attract followers, then you need to do what you can to help potential readers find your posts. Enter tags and categories*. When you write a blog post, categorizing it allows you to connect it to a list of topics/subjects/categories – rather like an index in the back of a book. Think of it as you “filing” your posts under key words that readers might search for (e.g. 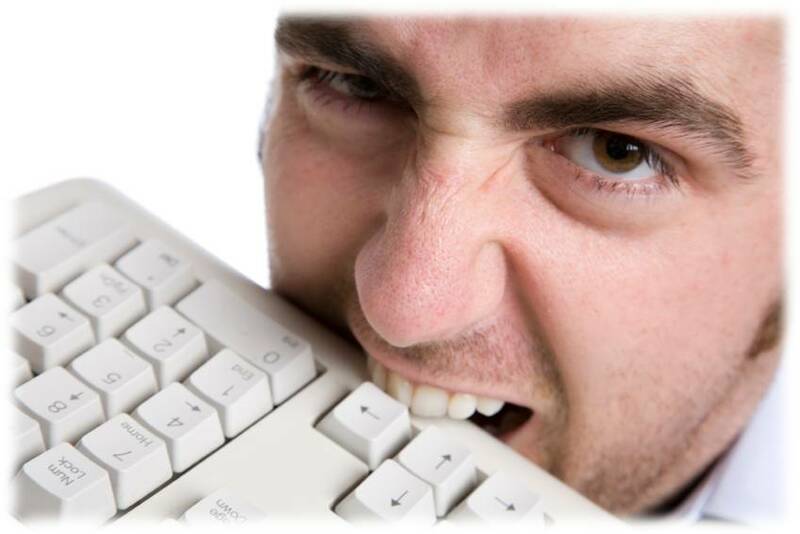 Blogging Tips); essentially you are optimizing your posts for search engines. If someone is searching for a particular, broader topic, and if you’ve categorized your posts effectively, then they are more likely to find your blog/posts. Personally, I also like to categorize my posts under my full name, the blog’s name, and my company name. If any one searches for me or my company, then they are more likely to also get the option to view my blog. Remember that the default is “uncategorized,” so make sure you start adding categories that are relevant to your posts and the blog’s focus to avoid everything falling under this. In WordPress, simply use the “Add New Category” option on the right hand side of your posts (as shown in the image left). You can also choose to use “parent categories” – so I could have “Communication” as a parent category, and “Communication Problems” as my sub-category. These are like sub-folders in your filing system. I tend not to use them as I find it adds too many layers and too much work! In comparison to categories, tags are more specific keyword phrases (and usually a little longer). They serve the same function as categories, but for more detailed search terms (e.g. How to Add Tags to Blog Posts). These you add simply by separating the tags with commas to create a list. WordPress also allows you to choose from your most used tags (see image), so if you’re writing about the same/related topics, you can simply use these. Once you publish the post, WordPress now provides you with a list of other keywords it pulls from your post and you can simply click on these to add them to your tags list. Play around, experiment, and try different tags and categories – you can always uncheck them on your posts or delete the tags. 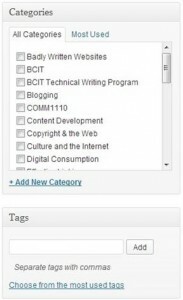 *Tags and categories are used in WordPress; Blogger calls them “labels,” which limits you to a combination of the two.